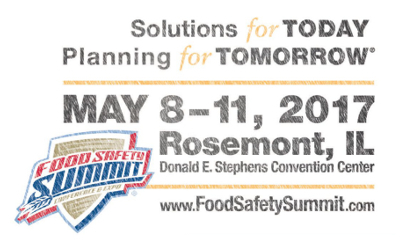 Food Safety Summit week begins today with sold-out certification courses and continues through Thursday, with more than 1,700 attendees expected for the annual conference and trade show. Just as Listeria has generated headlines in mainstream media in recent years, it had generated increased interest in the food industry. That interest at the Food Safety Summit in 2016 produces standing-room only attendance at a Listeria session, spurring summit organizers to devote a half-day workshop to the microscopic organism this year. Among the scheduled presenters for “The Latest in Listeria Control” are Sharon Birkett, vice president for North American Quality and Food Protection at OSI Group LLC, and Gillian Kelleher, vice president of Food Safety & QA for Wegmans Food Markets. Burkett said the meat industry has shown equipment and practices can be redesigned to reduce pathogens, but it requires action, not reaction. Kelleher agreed that other food producers could learn from reviewing what the meat industry has achieved in its work to reduce E. coli contamination. “If you highlight what can be done, you can get beyond the fear of looking,” Kelleher said. Natalie Dyenson, MPH, Vice President, Food Safety & Quality, Dole Food Company Inc.
Exhibit Hall opens for Welcome Reception: More than 185 booths are scheduled for the trade show floor.